The POI event held in Hungary this year was a great success. 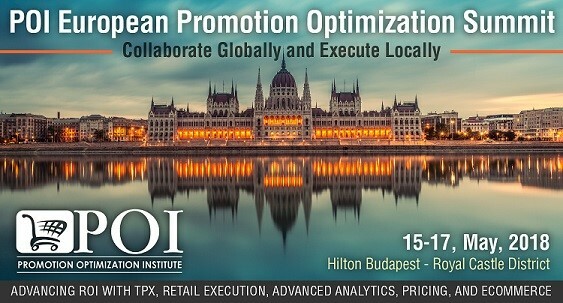 This years’ Promotion Optimization Institute Summit had its practical focus on using data and analytics to drive additional sales and improve efficiency, as the business community is asking the question of how to leverage all this available information. Manufacturers had a focus on consumer centricity, and digital supply chains, putting the consumer at the heart of their activities, with brand advertising and B2C direct ecommerce sales. What wasn’t broached was the issue this creates with their retail partners who have traditionally been the interface between brand and consumer. At the event was a good mix of software technology vendors and CPG manufacturers all looking for insights into the latest trends and thought leadership from the analysts and in the track sessions, including from Dale Hagemeyer. Peer to peer meetings addressed managing challenges and pain points, either commercial, or project related. Andres Jejen, Retail Execution, Product Manager, presented for AFS on the positive benefits of AI and Machine Learning and how technology can be used to look for patterns in data that can then be applied and actionable. Also addressed were areas of activity optimisation, from better routing between visits to combining perfect store data with scan data to optimise where you should visit to derive the best results for your company and your client partners. Andres also covered, optimisation of the shelf for the consumer, based on available behavioural data, all of which leads to greater efficiency, and selling opportunities driving manufacturers bottom lines.